After 24 long years in Indiana, this past fall, I decided it was finally time for a big change. I quit my job (OK, I got fired), loaded up my earthly belongings in a U-Haul, and decided to make the big trek northwest, three entire hours and one time zone change, to Chicago. While geographically pretty close, in most other regards Chicago and Indianapolis are worlds apart. I wasn’t totally unfamiliar with the city, nor did I go it alone, but I definitely could have gleaned some help from an informal guidebook. Coming up on almost a year, here is the wisdom I have acquired in my short time in Chicago. 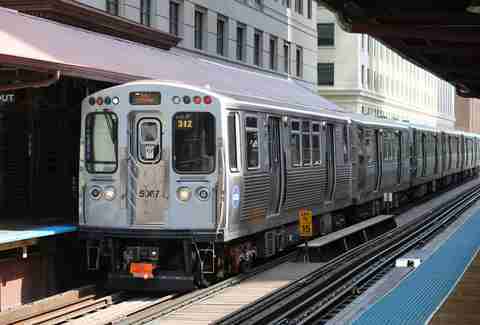 Chicago is frequently ranked one of the best cities in the US for public transportation. Coming from a city where public transit is much less prolific, the CTA felt like a godsend to me. There’s definitely a learning curve to proper bus and train etiquette, but just take solace that somewhere out there is a tourist or freshman transplant art student looking even more nervous and lost than you. Sometimes, though, even when you do everything right, the bus or train WILL betray you, either completely passing you by or having unexpected delays. As someone who formerly relied completely on a car or bike for transportation, there is a real solace in being able to reconcile with the mantra “I can only go as fast as the CTA.” It helps that Chicago is essentially a huge grid so it is nearly impossible to get lost. When warmer weather rolls around, it's like the entire city emerges from a dungeon that it's been trapped in by an evil wizard for 20 long years, which leads to a voracious bloodlust to party. Go to the beach, and a patio, and a rooftop, and the park. 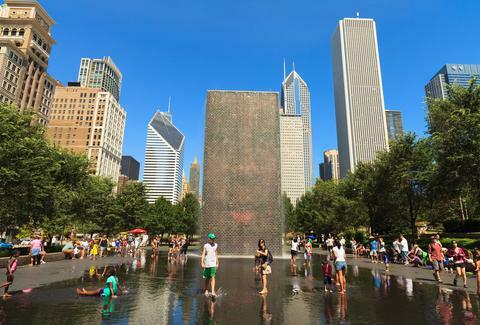 Summer in Chicago is fun, like, really really fun. You might even get over stimulated from the constant onslaught of shows and block parties and cookouts and festivals. Everyone talks about the weather -- all the time, just embrace it. There are worse things to talk about, like crossfit. 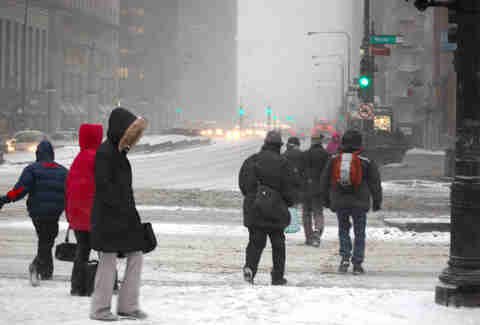 I was hesitant to start bicycling around Chicago, but as soon as I did there was no going back. Chicago is a huge flat grid, with tons of bike lanes. If biking on streets congested with cars and pedestrians makes you nervous, there are tons of quiet side streets to take alternate routes. 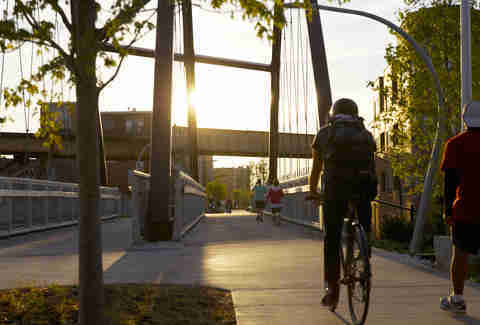 When traffic is congested, biking is often as fast or a faster way to get around than driving or transit. Use proper hand signals, wear a helmet, and embrace showing up to work really sweaty. In a city with nearly three million residents, you'd think the streets would be overflowing with bagels. And sure, they technically do exist in Chicago, but finding a true bagel, however, in my humble opinion, is way too complicated a task. Chicago just simply isn’t the bagel paradise you might find in say, New York City, where a perfect bagel is available on nearly every corner (that’s the only time I’ll trumpet NYC over Chicago, promise). Don’t despair, though, Chicago is overflowing with other pastry, breakfast, and bread shops. We will get through this together. The traffic law enforcement in Chicago is loose, to say the least. When driving through a small town in Indiana, you will get pulled over going .001 miles over the speed limit. In Chicago, the lines painted into the street are merely suggestions. Speed limit? A recommendation. Turn signals? I guess you can use them, if you’re some kind of square. The mentality I have adopted is “other cars don’t want to hit me.” It is the most solace I can muster. Say a prayer and drive confidently, and don’t let road rage consume you when you’re stuck in traffic for 30 minutes trying to move one mile. The very first Taco Bell Cantina in the nation opened recently in Wicker Park. 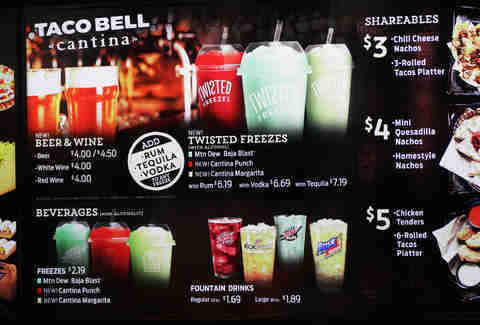 The idea is simple enough -- do what people were already doing (adding tequila shooters into their Baja blast). The Taco Bell Cantina, however, allows for the added atmosphere of hanging out in Taco Bell while drinking, as opposed to after, possibly in the hopes of preventing a devastating hangover through molten cheese. At the very least it is an experience, a true American landmark, a part of history itself. Bring your friends, your parents, your mentor, show them what Chicago is really about. Back in Indianapolis, most bars close at 3am -- the perfect, most reasonable time to close. If you make it all the way to 3am, you know you’ve done well. You’re tired, but satisfied, and ready to take yourself home for a restful slumber, or grab some much-needed greasy nourishment from a 24-hour diner. In Chicago, most bars close at 2am. For many people, 2am is the correct time to go to sleep. As someone who works in the service industry, 2am is unbearably early. For my scummy, sleepless brethren, Chicago has an innovative solution known as “4am bars.” Now, 4am bars are never exactly an ideal place to be, and they are also few and far between. The city of Chicago makes it pretty difficult to get a permit to be open until 4am, and thusly the crowds from dozens of 2am bars, all across the neighborhood, find themselves crammed together at the only place within walking distance still serving for one last drink. In some ways it is beautiful, the way people of all different backgrounds come together in alcoholic and sexual desperation. Other times they are like a cesspool of people who were once peaceful strangers but are now somehow suddenly all enemies. Just try to enjoy yourself and not get into any trouble, maybe call an Uber, and definitely get a glass of water. Don’t even think about an after party, you are too tired, go to bed, stop Tweeting. Historically, politically, generationally, Chicago has more than its fair share of scammers. Don’t take it personally, eventually you will learn to dodge them as you get oriented. To save you a little heartbreak, if you’re going to do deep dish, don’t stop at any random, by-the-slice places you happen upon. They will likely serve you a triangle of puffy dough with a layer of sauce and cheese on top and tell you its deep dish. If you’re going to get a true Chicago-style pie -- which will not be that often as you think -- for the love of God do your research. 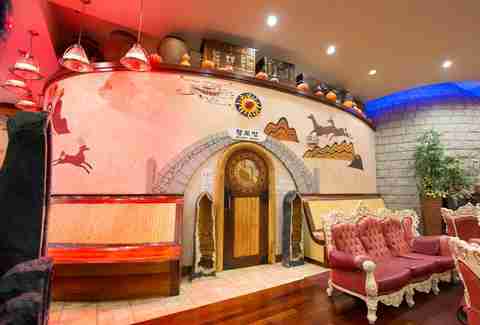 King Spa, a luxurious and ornate Korean spa, is actually just outside of Chicago in Niles, IL, but it is perhaps one of Chicago’s biggest assets. A single pass gets you’re a full 24-hour access to the spa, which includes public hot baths, dry saunas, a food court, and more. Exfoliate your problems away. As a Midwesterner, I’m used to harsh, cold winters. I was still not ready for winter in Chicago. There is definitely something about the city, be it science or God’s wrath, that makes the winters so bad. Daylight savings is also an absolute scourge on the city as one day you are peacefully living your life, and the next thing you know its 4:30pm and the sun is inexplicably missing. Everyone you know is going to talk about their seasonal depression, and their regular depression, and the futility of life itself. At times it seems like you’re not going to make it. The friends who you still talk to and hang out with during this long hibernation -- they are your real friends. This winter I bought an electric blanket, two humidifiers, a healing crystal, and no less than nine plants. For a more cost-effective plan, get a good coat and do some journaling. You’re going to be fine. Holding down a job in a competitive metropolis is tough. For a new transplant who only knows a handful of people, getting a job is even harder. In my 10 months here I’ve worked four different jobs, and only one of them was gotten without a personal referral. My old manager said that from one Craigslist post, she got 400 responses, and absolutely no one wants to sift through 400 applicants to get to you, no matter how good your resume is. For many hiring managers, they would rather just hire someone they know, or someone you know. So make some friends, you awkward introvert. As a naïve country mouse, city beaches are an anomaly. You’re going to be camping out with a cooler on a sandy shore while huge skyscrapers tower just behind you. You’re barely a few hundred yards from cars zipping down Lake Shore Dr, but there’s something so peaceful and serene about these little oases on the face of Lake Michigan. When the sun descends behind the skyscrapers, it is hard to resist reveling in how lucky you are to be here, clogging your Instagram feed with boring sunset pictures. If you time your trip correctly, you might even be able to sweet talk your way into a cookout. At this point of you are probably like “why is this writer so addicted to food and booze?” In some ways you’re right, I am. In other ways, Chicago is an absolute monster of a city when it comes to drinking and eating, probably this city’s biggest pastimes. I don’t know much about sports, but from what I understand they also heavily revolve around beer and hot dogs. The streets of Chicago are littered with carts and snack stands. In almost every neighborhood you can find cheap, delicious food served to you via cart or counter. There are of course hot dogs, which people will attempt to shame you out of putting ketchup on, but you have to be strong. There are $1 tacos. There are street carts serving elotes, fresh mangoes, snow cones, and sorbet. 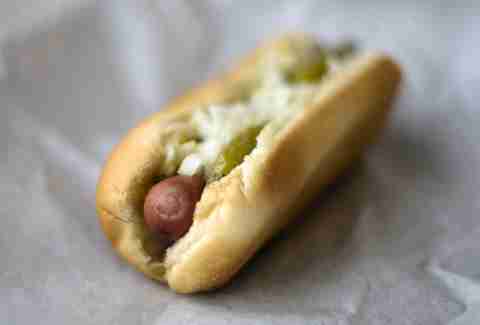 There are polish sausage carts and Italian beef. Eat a jibarito -- steak or chicken, lettuce, cheese, onions, and tomatoes sandwiched between fried plantains. There’s a guy with a bag of handmade tamales that walks around bars near closing time. You didn’t even know you wanted tamales but now here you are, desperately eating them with a pitcher of Old Style. 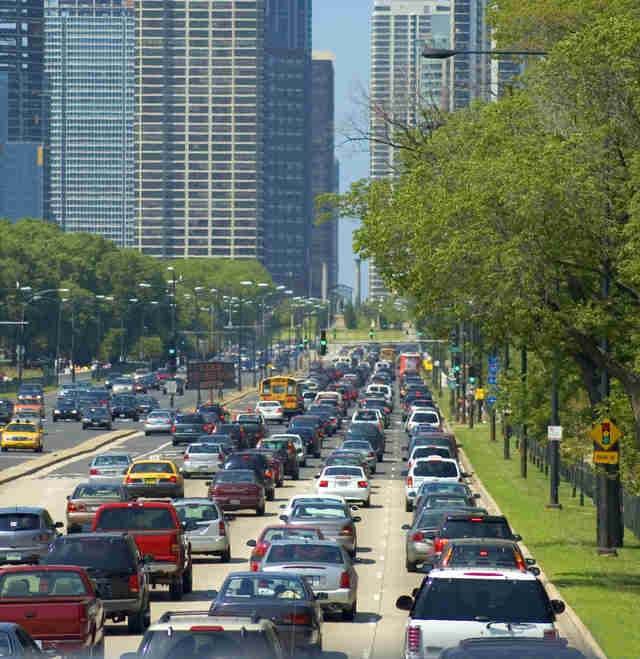 The worst thing you could do in Chicago would be to confine yourself to a few square miles. Go down to Hyde Park for a day trip to Promontory Point, or the Museum of Science and Industry. Head to Pilsen for the best carnitas you’ve ever had. Get off at the Argyle Stop on the Red Line to eat in Little Vietnam. Visit the recently reopened Humboldt Park inland beach. Spend a day walking around Chinatown. Go to the Garfield Park Conservatory. 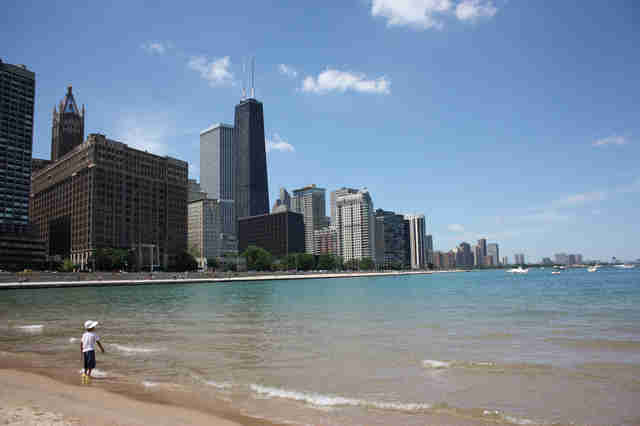 Chicago is as dense as it is expansive, and you’re selling yourself short by not exploring all it has to offer.